THE HAND OF GOD, THE POPE, OR THE CLAW OF SATAN? Title: THE HAND OF GOD, THE POPE, OR THE CLAW OF SATAN? Subtitle: So many of the depictions found within Roman Catholicism are identical to those used in Satanism, we should not be shocked any more. But, these comparisons shall shock you. 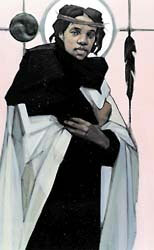 It was not so long ago that the National Catholic Reporter chose a new image of "Jesus" for the millenium. The image was filled with symbols of witchcraft which didn't seem to bother the nun who made the decision of which "Jesus" best represented the Roman Catholic version of "Jesus". This image of "Jesus" also had a very strange looking hand which closely resembles a claw. I was looking through the Short Catechism Of Mary, by Cardinal Charles Journet, and there I discovered another picture of "God" with a clawed hand holding the universe. In witchcraft, "Three is a magic number in spells and rituals...Many spells call for an action to be repeated three times, as in the gypsy love spell which calls for a candle to be pricked three times" (A Treasury Of Witchcraft And Devilry, Gupta and Brandon, 70-71). 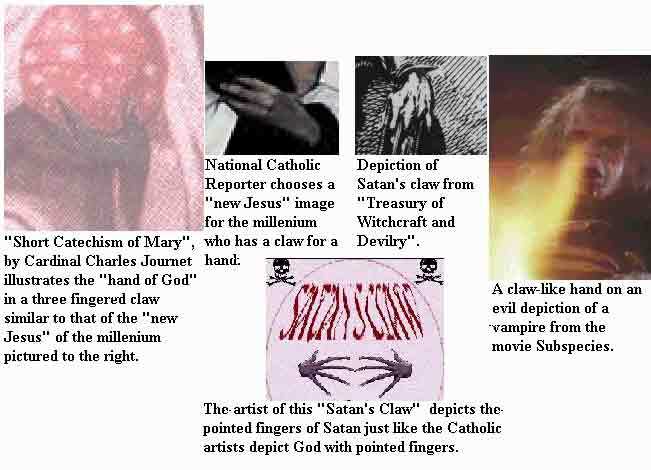 It's curious that Satan and vampires are all depicted with claw-like fingers. But, now notice that this "God" and "Jesus" are also depicted with the same three-clawed hands! "Is the Blessed Virgin powerful enough to obtain the salvation of her true servants? Yes. The Blessed Virgin is powerful enough to obtain the salvation of her true servants, that is, those who from the bottom of their hearts without ceasing ask her to help them to rise from sin, to live in the light of the Gospel, and to die in the love of God." Notice in this picture that God the Father is depicted as holding the globe of the earth in three-clawed hands! First and foremost, we were commanded not to make any image of God! So, not only do they disobey God's word concerning idols and images of God, but then they make His image with demonic like claws! What blasphemy! Have they no fear of the Lord? 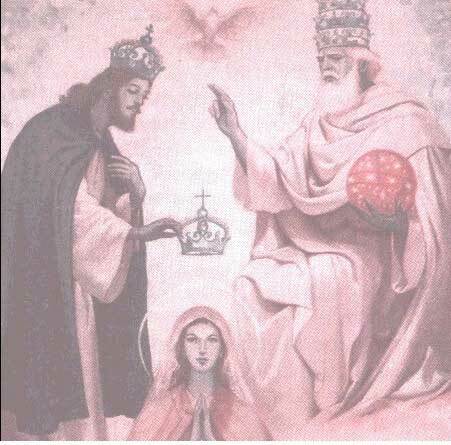 While examining the picture of "God", "Jesus" and "The Holy Ghost" (the bird) crowning "Mary", I noticed that "God" was wearing the same triple crown tiara that the pope wears. It is not lawful for anyone but the pope to wear that crown. I wondered why the artist chose to put the triple crown tiara on "God", but only a single crown for "Jesus" and "Mary". 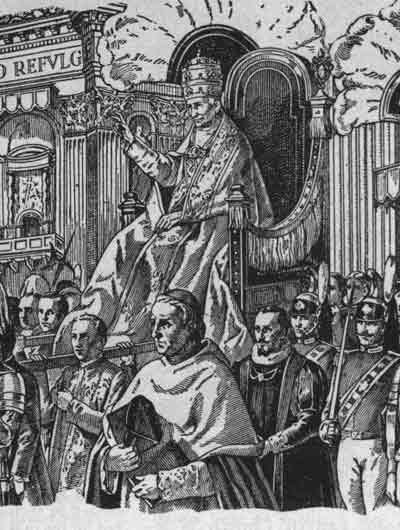 The triple tiara signifies that the pope has all power in heaven, on earth, and in hell. Now, let put all these images together so you can see that the Pope is depicted with the same demonic three-clawed image as are the demons and witches in these other pictures. Once again, we are confronted with Jesus' warning: "Ye shall know them by their fruits". These pictures are definitely "rotten fruit" images, and confirm the fact that the Roman Catholic Church has always been a practice of White Magic Witchcraft.